Click image to enlarge Wigwam Burner, Clatskanie, Oregon. Image taken October 17, 2013. A wigwam burner, also known as tepee burner or beehive burner, is a free-standing conical steel structure used in logging mills to dispose of waste wood and sawdust. 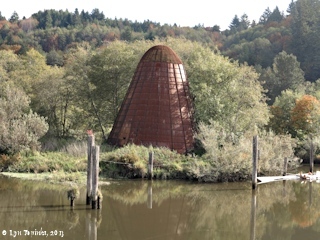 Wigwam burners were once commonplace at lumber mills in Washington, Oregon, California, and other western states, however, due to environmental concerns, the wigwam burner has been outlawed. Once numbering in the thousands, they are now almost non-existent. The steel-jacketed, brick-lined, cylindrical burner was perhaps the most common type. A shell made from steel plates was lined with common brick and firebrick ... Foundations were made of brick or concrete, and often consisted of a central core several feet in diamter and an outer base on which the burner rested. There were grates between core and base. Fuel dropped from about 40 feet onto the central core. The top of the burner was covered with a 3 by 3 mesh, 14-gauge wire screen. The base area was from 3.5 to 5.5 square feet per 1000 board feet of mill output. Exteriors were often painted or tarred to prevent corrosion. Maintenance costs were high because the brick-work had to be replaced annually. Some steel, water-cooled burners were used which had no brick lining but, instead, had a watertight steel jacket surrounding the inner shell, which was from 12 to 15 inches thick. These burners were constructed in all sizes up to 50 feet in diameter and 115 feet in height. Paint and asphalt were used to protect the outer surface. Very few were built, however, because of high construction and maintence costs. Open pit fires were used then, as they sometimes are today. 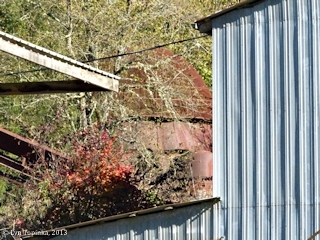 These consisted of a semicircular screen or wall rising 20 to 30 feet on the side of the fire toward the mill. Brick shell burners were cylindrical and similar to brick-lined shell burners, except that they were shorter. Steel straps were placed around them for support. An air-cooled burner was placed on the market in 1916. It had a conical base and a cylindrical stack without any brick lining. The foundation was a concrete wall 1 foot thick and extending 2 feet above the grate level. The framework was made of structural steel and iron pipe, with an outside covering of medium-weight steel plates rivited together. The conical shape place the base of the burner farther away from the fire, and air circulation cooled it. These burners cost 40 to 50 percent less than brick-lined steel burners. This was the beginning of the tepee burner commonly in use today. 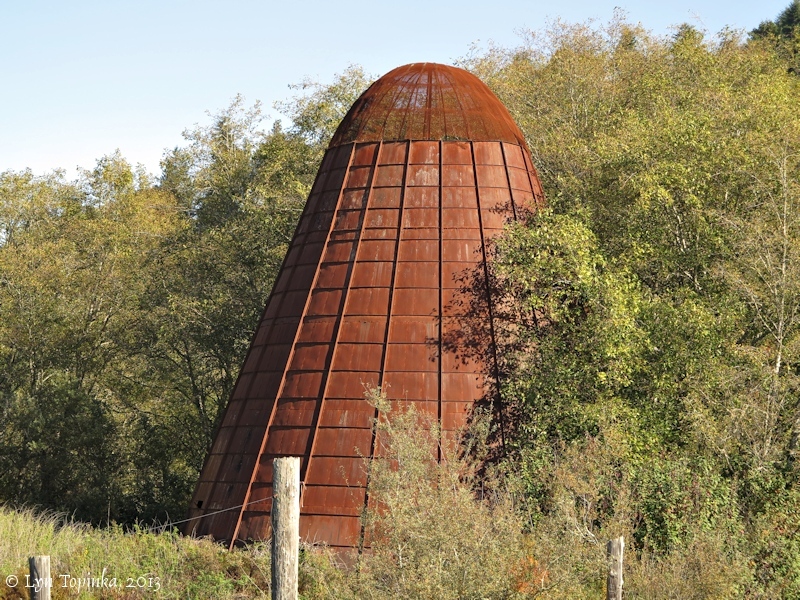 Most builders have abandoned the cylindrical stack and now construct burners which are conical from base to screen. Most tepee burners have two screens at the top - a flat, horizontal screen and a hemispherical one. Tangential openings at the base to supply overfire air to the fire have been used for many years. Underfire air is usually supplied by one or two blowers to cones or burner grates. Some burners are elevated to provide tunnels below the grate level to admit underfire air. The practice of building prefabricated burners has been developed since 1946. These are built in sections, running from the base tot he screens. The structural framework is on the outside, with the plates on the inside. The burners are raised into place on location and bolted together in a short time. They can be dismantled easily, transported, and re-erected at another location." Source: U.S. Environmental Protection Agency, 1976, "Combustion of Wood Residue in Conical Wigwam Burners"m EPA 340/1-76-002, February 1976. 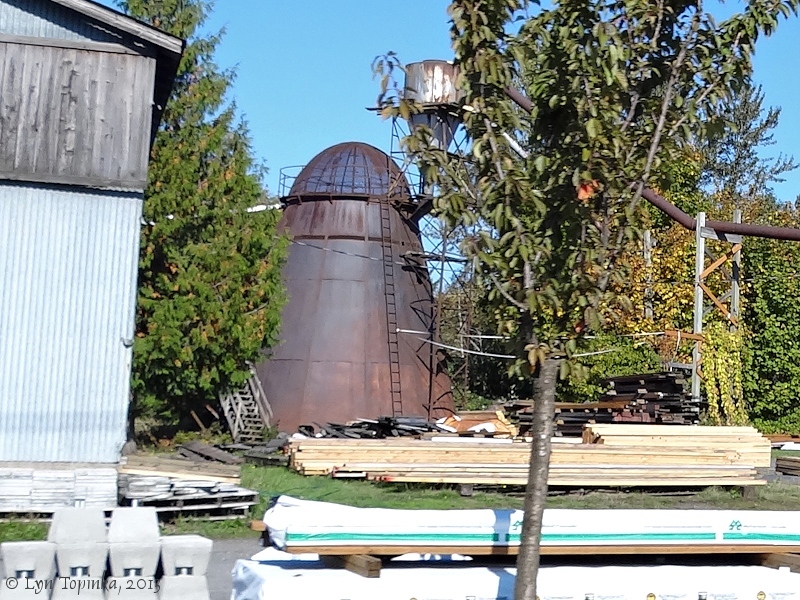 Located on the outskirts of Battle Ground, Washington, this wigwam burner was visible from the lumber company's parking lot. We asked but were not given permission to get any closer (safety reasons). Click image to enlarge Wigwam burner, Battle Ground, Washington. View from lumber company parking lot. 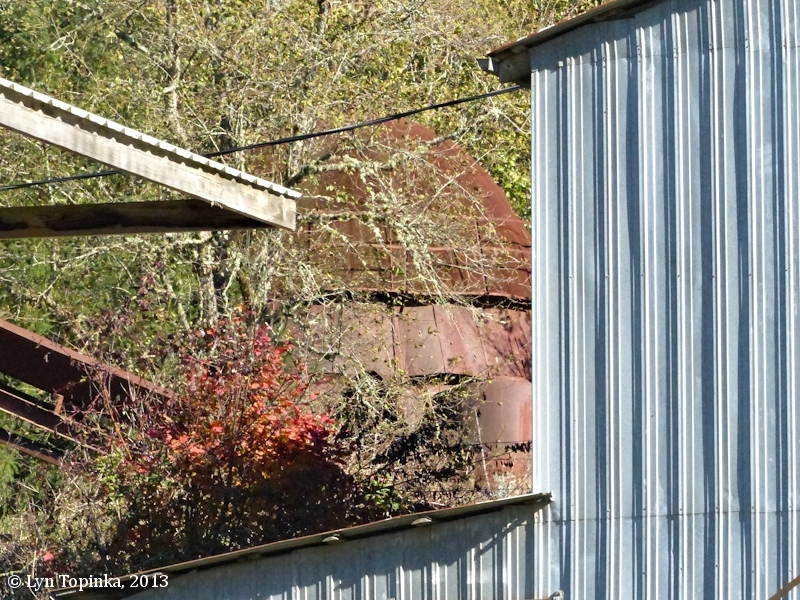 Image taken October 21, 2013. 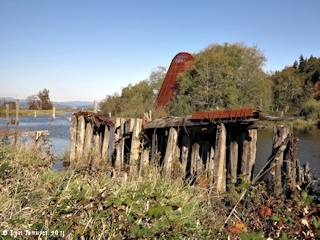 The Broughton Lumber Mill, located in Hood, Washington, closed at the end of 1986. 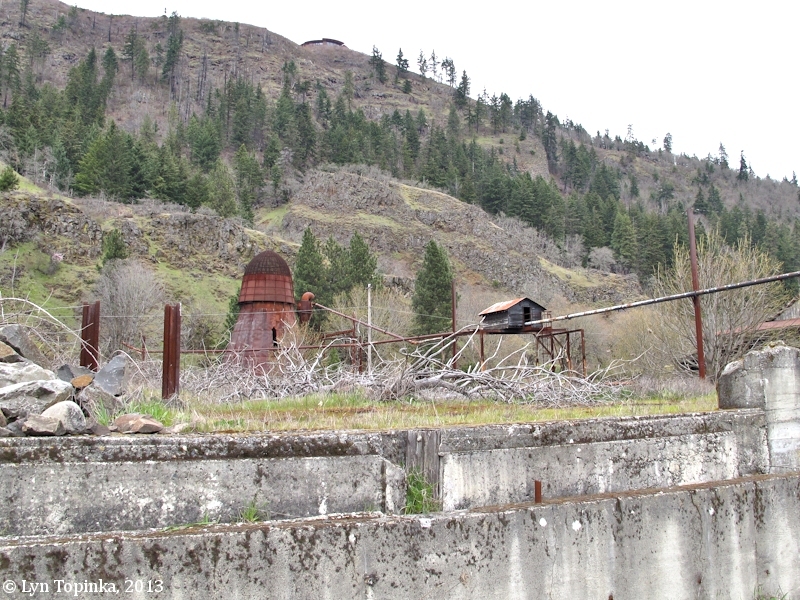 The buildings still remain and can still be seen on the north side of Washington State Highway 14 across from the Spring Creek Fish Hatchery. 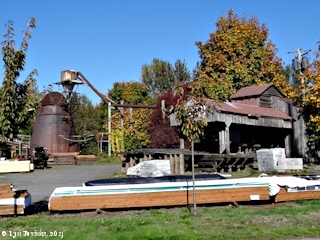 Click image to enlarge Wigwam burner, and sawdust feeder and line, Broughton Lumber Mill, Hood, Washington. Image taken March 24, 2013. 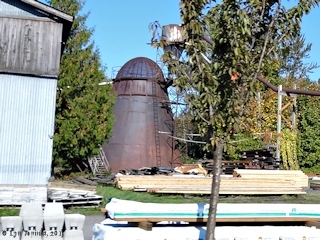 Click image to enlarge Wigwam Burner and sawdust feeder lines, Broughton Lumber Mill, Hood, Washington. Image taken March 24, 2013. The Benson Timber Company began operations in Clatskanie, Oregon in 1902 and lasted until 1936 when it closed its doors. Simon Benson, along with partner O.J. Evenson, were the originators of the unique cigar-shaped ocean-going log raft, known as the "Benson raft". From the mill in Clatskanie, these rafts of logs were then assembled on the quiet waters of Wallace Slough and towed to San Diego, California. 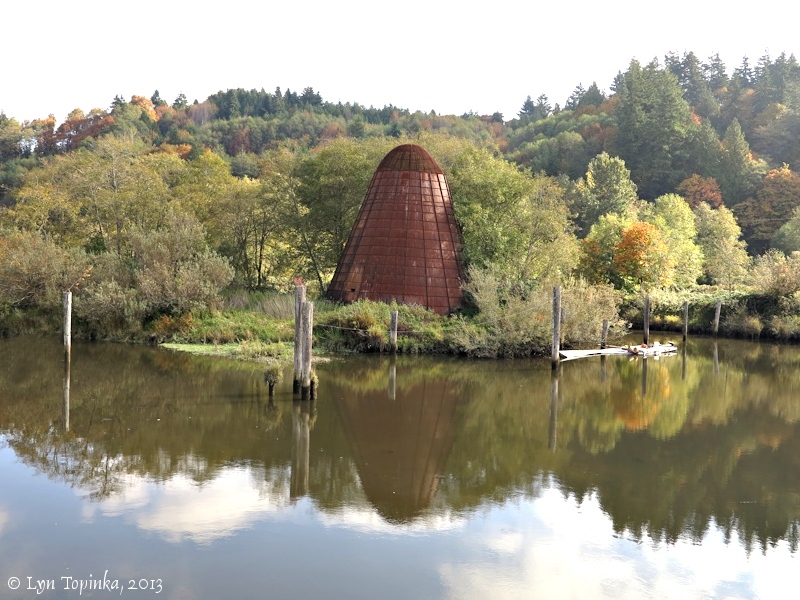 Click image to enlarge Wigwam Burner on Beaver Slough, Clatskanie, Oregon. Image taken October 17, 2013. The Sandy wigwam burner is located in Sandy, Oregon, at the Olaf M. Oja Lumber Company, and can be seen from Oregon Highway 26. 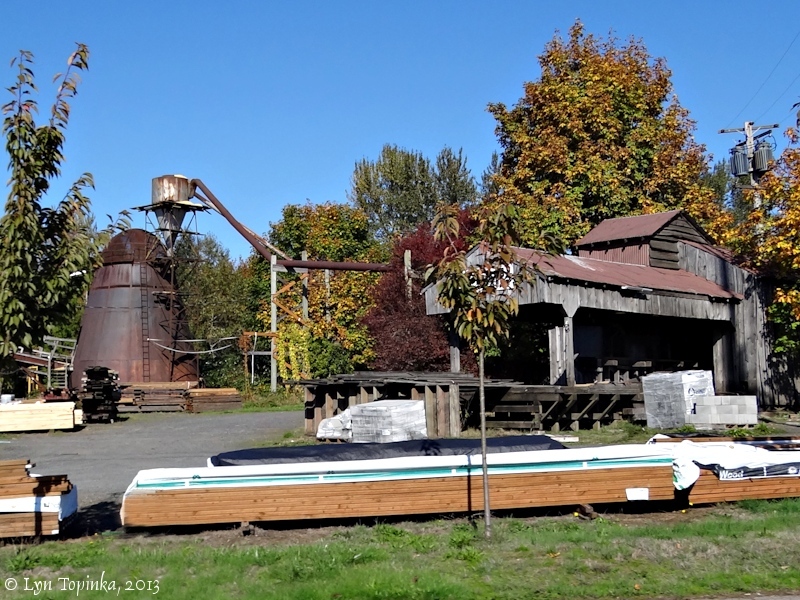 The Olaf M. Oja Lumber Company has been in business for over 60 years. 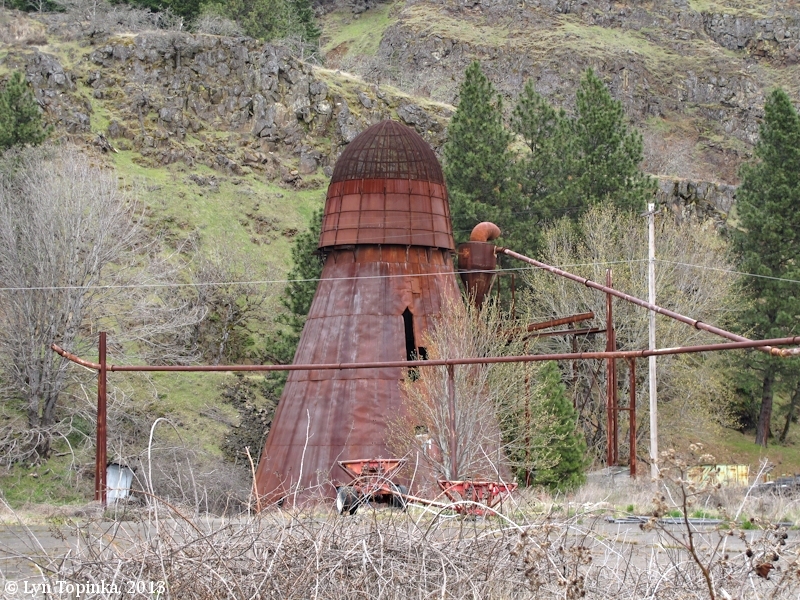 Click image to enlarge Wigwam burner, Sandy, Oregon. View from moving car on Highway 26. Image taken October 14, 2013.